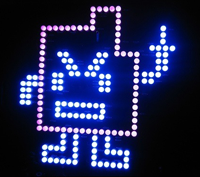 That’s the message on the website of New York City-based Interference Inc today, explaining their response to the panic reaction of by bone-headed Boston officials who yesterday shut down the city when they discovered the LED signs that had been up all over the city for the past 10 days to market Cartoon Network’s Adult Swim show “Aqua Teen Hunger Force” Adult Swim apology here. The fiasco that took place there the other day is a clear sign that the City and the State’s leaders and Boston’s modern-day Keystone cops are 100% out of touch with the Internet. Granted, it was absolutely dim of the marketing people not to get permits before putting anything on public property. But it also was completely clueless of the City fathers not to Google “Aqua Teen Hunger Force” before pulling out the terror-response team. All the fuss was over this sign. Granted, someone leaving their gym bag on the train these days can trigger panic, but there had to have been another way besides detonating these to figure out if they were lethal. And who’s really taking the rap? The two guys who were hired to put up the signs. They were arrested. Peter Berdovsky, 27, and Sean Stevens, 28, were released on $2,500 cash bond — apparently amused by the situation. They face up to five years in prison. They say they were paid $300 a sign to place the devices in Boston, and they pleaded not guilty Thursday to placing a hoax device and disorderly conduct. They made their media statement into performance art, apparently on the advice of their lawyer. Interference CEO Sam Travis Ewen stayed out of sight for a second day yesterday and could not be located for comment. The company did not return calls seeking comment and its offices were closed Thursday. 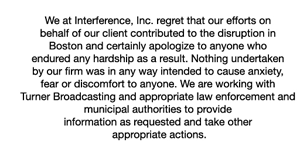 Phil Kent, Turner’s chairman and CEO, made the apology in full-page ads in Boston newspapers for “the confusion and inconvenience” caused as highways, bridges and river traffic were shut down in several areas while police checked out the signs, some of which had protruding wires. Boston Mayor Thomas Menino said the company had agreed to pay for the costs of the security scramble, The Boston Globe reported on Friday. He estimated the costs in Boston alone would be more than $500,000.